The blue Hyacinth Macaw is the largest of the Macaws, and the second largest parrot in the world! The large Hyacinth Macaw Anodorhynchus hyacinthinus is a majestic beauty. Visually it appears to be the largest parrot in the world. But that is not quite so. The elongated body of the Hyacinth reaches about 37" (95 cm) in length and it has an impressive wingspan up to about 42" across, which is the most expansive parrot in the world. But the Hyacinth is not all that hefty, it only weighs up to about 3.7 lb (1.7 kg). The worlds largest parrot is actually a flightless, ground-dwelling bird. It is the species Strigops habroptila, commonly called Kakapo which means night parrot. This hefty bird only extends to 24" (61 cm) in length, but in weight a mature adult can be up to 9 pounds (4 kg)! The Kakapo is endemic to New Zealand and is quite a pretty bird in its own right. Rather than being blue like the Hyacinth, it is a yellowish green color mottled with dark stripes and spots giving it an owlish appearance. Its scientific name actually means "owl-faced soft feathers". The beautiful Hyacinth is pretty much an all blue large Macaw. The rich cobalt blue of its coloring is what influenced its name. It is a calm Macaw and known to make an excellent pet. Hyacinth Macaws have a very even temperament. They are sweet, extremely gentle, and are not inclined to make a great deal of noise. They are affectionate and playful, and become quite attached to their human families. This pet Macaw may possibly pick out one person for special affection, but Hyacinth Macaws are more inclined to being a part of the entire family and are good with children. If they are socialized at a young age, these Macaws are also quite eager to meet and play with new humans. The Hyacinth is quite intelligent and is prone to playing jokes. Jokes can include jumping on you or your company's head from a distance. With its size, this is pretty funny. A good joke is laying on its back with its feet straight up playing dead. They will frequently stare down at you from the ceiling fan (be sure it is off!) or break out of their cage. They don't destroy the cage but are more inclined to just take the lock off. They are inquisitive and quite entertaining. Hyacinth Macaws do speak although their ability for this is limited. Still, they do make their desires known. Once their keepers understands their call for play, hugs, or special food there is a definite relationship that develops between this gorgeous feathered pet and its humans. Distribution The Hyacinth Macaw Anodorhynchus hyacinthinus, also known as the Hyacinthine Macaw, was first described by Latham in 1790. It originates in South America and its habitat is primarily in Brazil, eastern Bolivia and Paraguay. There have been a number of different reports as to what the Hyacinth Macaw's natural habitat is. Some say the rainforest while others say they seem to prefer large open areas to the rainforest. They are also seen in marches or where palms are found. They were first spotted in 1790 and then introduced to civilization in 1916. Hyacinth Macaws were immediately popular because of their affectionate nature and entertaining ability. There became a great demand for this Macaw. Because of deforestation its numbers were being reduced in the wild and became even further reduced as individuals hunted them for pets. In their native regions they have been seen in pairs, and on occasion in small flocks. Most Macaws feed on seeds, nuts, and fruits. The Hyacinth seems to prefer the fruits of palms, although some have been found to feed on other fruits in nature as well. Status The Anodorhynchus hyacinthinus is on the IUCN Red List for Endangered Species as Endangered (EN). Hyacinths have been on the Endangered Species list since 1988, due to habitat destruction and over-collection. It is estimated that their numbers have been reduced to between 2,000 – 5,000 in the wild. There are conservation efforts for the Hyacinth Macaw which has some measure of success and they are also being successfully bred within the United States and other countries. DescriptionThe Hyacinth Macaws are an amazing cobalt blue, which is how they derived their name. The blue feathering becomes slightly darker on the wings, and the underside of the tail is a dark gray. They have a featherless ring circling the eye that is a bright daffodil yellow. This color is also found running down both sides of their gray-black beak. This combination makes the Hyacinth appear to smile. Their eyelashes are blue and the skin of the bird has a yellowish cast to it except for the legs, which are a dark gray. Their beak is quite large enabling them to meet their dietary requirements by cracking extremely hard nuts. This parrot is the largest of the Macaws, measuring often three and one-half feet in length with a wingspan of close to five feet. These are a large, full sized Macaw. A mature adult averages about 37 inches (95 cm) in length with a wingspan that can reach an impressive 42" (105 cm), and they can weigh up to about 3.7 lb (1.7 kg). These Macaws are also quite long lived, with lifespan up to about 60 years. Care and feeding The Hyacinth has unique feeding requirements. In the wild the hard palm nut or fruit is the mainstay of its diet. They require a much higher fat diet than many Macaws. Macadamia nuts are used as a main stable for this Macaw's diet as well as other nuts. Coconut is also desirable. Fresh fruits and vegetables, while a part of their diet, are a small part compared with other parrots. Pellet diets are said to not be appropriate for the Hyacinth as the high protein content can cause kidney problems. Many breeders no longer offer pellets to Hyacinths. In the wild they feed primarily on nuts, seeds and some berries. They do catch and eat a small amount of meat. Food and water should be available to them at all times and human food or prepared foods removed from the cage after 4 hours. HousingA roomy cage is required for the Hyacinth Macaw, at least 3 x 4 feet (91 x 122 cm). Even in this size cage it is difficult for them to extend their wings. They will require a great deal of time outside of their cage in order to exercise and just move their wings. If you should decide to purchase one of the larger wire cages that have powder coated 8 gauge wire, you will loose your money. The Hyacinth Macaw can snap 8 gauge powder coated wires as easily as you can chew popcorn. A 3 gauge wire is strong enough to use for building a flight though it must be made secure through U-bolts and lock nuts. The Hyacinth Macaw is quite clever and if you can put it together, they can take it apart. A variety of perches should be used of varying size and texture. Manzanita or Ribbonwood perches for the Hyacinths will most likely be needed because of the hardness of the wood. Doll rods should not be used. They are too small and too smooth. A rougher texture rather than smooth makes it easier for them to perch and is better for their feet and legs. A concrete perch should be placed as the highest perch in the cage and next to a toy. At times during the day, and usually to sleep, they will perch there and it will save them (and you) from the ordeal of having their nails filed. Hyacinths can tolerate a wide variety of temperatures from quite cold to very warm. However, they should be kept away from drafts. See Macaw Housing or more information. MaintenanceTheir cage should be kept clean and this is quite easy to do with the cage paper or newspaper under the grate and just pulled as needed. The cage should be wiped down with a disinfectant when needed to insure its cleanliness. The water should be kept fresh and changed daily and the bowls should be kept clean..
Social BehaviorsThe Hyacinth Macaws desire contact with their human family. They bond very strongly and desire both affection and playful attention. In the wild these parrots associate in pairs within a small flock. As a pet in your home, you or members of your family are the other half of the pair and the small flock. If you would like a companion that has the temperament and ability similar to that of a three year old child, than this could be the parrot for you. They are not children, as they have the instinctive, natural parrot behaviors developed to survive in nature. But like a three year old, a Hyacinth takes a great deal of time. One should not invest the money in this Macaw unless definitely intending to give freely of your time. See Macaws Social Behaviors for information on developing a well rounded friendly Macaw. Handling/TrainingThe Hyacinth Macaw is eager for attention and play and because of its gentle and even disposition, it is easier than most parrots to handle and train. They're eager to please and be with you. Usually, after the basic command of up they like to learn new things and respond well to additionally training. They love to be handled and can be very clownish in their play. They can take a few running steps and pounce and repeat this game for quite awhile. They are frequently on their backs anxious for play and a belly rub. Tag is fun and swinging from the chandelier is great fun. With all parrots, taming and training takes trust and patience. Macaws are very intelligent making them easy to tame. They are also very adept at learning and quick to train. They excel best at learning tricks and small tasks. They are not as inclined to talk and mimic as some of the other parrots, notably the Amazon Parrots, but they can learn a few words or phrases. The Blue and Gold can develop a general vocabulary of about 15 or more words or expressions. 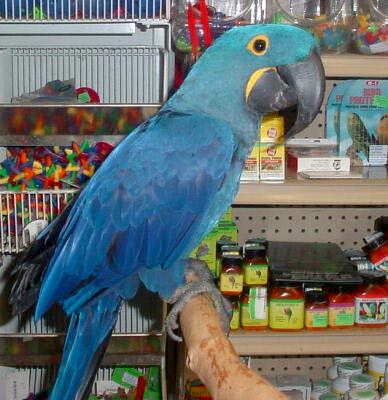 ActivitiesThe Hyacinth Macaw loves to play and will require a variety of toys. Because of its size, its beak and playful disposition, many toys will be needed. They chew wood into very small pieces and the large Macaw toys of wood will perhaps last a day or two. Possibly it would be better to purchase wood and color it on occasion. Large Macaw acrylic toys last a little awhile but certainly not a month. You can purchase or put together stainless steel toys buying parts from your local hardware store. Nuts strung with washers and then a lock bolt will make noise and is used as a dumbbell by the Hyacinth. Metal cups or spoons are a good choice and you can put wholes in stainless steel bird bowels and place nuts and bolts through the holes. Stainless steel should be used. They enjoy the bird music boxes and stuffed animals. Never use rope. The Hyacinth prefers to be around their human companion and although content to be on its perch they prefer to follow you around the house. If you are in another room they will frequently contact call to make sure you are still there. This requires a response from you to insure your child you will be back shortly. Their call is quite raucous and it would be best if you answered quickly. Sexing - Sexual DifferencesNo visible differences. There is no for certain way to distinguish the male Hyacinth Macaw from the female. In order to know whether you have a male or female, the bird must be sexed. DNA / Feather or surgical sexing is recommended. Breeding/ReproductionHyacinth Macaws are very bonded to their mate and share in the responsibilities of nest making and child rearing. The Hyacinths are very affectionate with their mate. They have been seen placing their wing around their mate and in some pretty heavy kissing sessions.The Hyacinth Macaw will nest in holes in trees that already exist and just make the hole larger. Two eggs are normally laid and hatched in approximately 26 - 28 days. They will usually lay two eggs, but normally will only feed one baby. The first hatched grows so rapidly by the time the second chick hatches, he isn't strong enough to compete and alert his parents for food. They wean while being hand fed at about 6 - 9 months. A large nest box is required so they may lie vertically. A box made of just wood should not be used as the Hyacinth can eat through it overnight. Even while sitting eggs, the female is so curious regarding events outside the nest box, she will frequently come out to see what is happening. See Macaw Breeding for more information. The Hyacinth Macaw has also been crossed with other large macaw species to develop a number of hybrid Macaws. These include first generation (F1) hybrids like the Caloshua Macaw, Emerald Macaw, Milicinth Macaw, Hyacinth Macaw x Scarlet Macaw, and second generation (F2) and later generations hybirds such as the Hyacinth Macaw x Jubilee Macaw. It has not been hybridized with Mini Macaws. If you notice any of these bird illnesses in your Hyacinth Macaw immediately provide a warm, draft free, secure environment kept at about 86°F (30°C). Place food and water close to the perch where it is easily accessible. An ailing parrot should be taken to an avian veterinarian for diagnosis and treatment. Behavior problems in a pet Macaw usually stem from something that is missing in the bird's environment. Some of the most common are lack of trust, becoming bored, or lack of interaction with people or other birds. When these things are missing that can lead to problems resulting in undesirable behavior. Try to develop a bond of trust and spend time with your bird to help avoid these problems. We have also had good success with Chet Womach's Parrot Training Course. He offers free 3-day introductory course so you can try it out before you buy anything. Availability Hyacinth Macaws are rare, they are not readily available and they are quite expensive. A Hyacinth can be obtained from a breeder (which is strongly recommended), a pet store, or a broker. The cost can vary significantly, ranging anywhere from $9,000.00 to $14,000.00 USD. Be prepared to be placed on a waiting list. The number of available Hyacinths is small, and they are an expensive endeavor for most breeders. If you desire a Hyacinth just be patient and establish a number of contacts. What is the price of your hyacinth? What is the price of your hyacinths? we have an adorable hyacinth macaw parrot and we are giving her for adoption because we have to travel soon.contact us via SMS for details+1 815 386 5056. My female Hyacinth needs a male mate. Her mate died last year of old age after 14 years of living together. She misses his attention terrably, and is trying to hatch a golfball because of her need to become a mommy. Will travel to get him, name price and age. Very interested in buying the pair. i'm interested in buying hyacinth macaws. do you have a pair rightnow and if yes how much it costs. where is your location. i,m from india, hyderabad. We have a lovely hyacinth macaw parrot and we are giving her for adoption because we have to travel soon.contact us via SMS at +1 815 386 5056. Make sure you include your email and location. Hi. I am very interested in ur hyacinth. Hi. I have 2 Blue and Golds, a Cockatoo and an African Grey. I am looking for a Hyacinth who needs a home to add to my flock. I live in PA and my number is 814-591-8757. Thank u!